Who doesn’t love a surprise birthday party?! How about one in the morning? Read below for fun breakfast party ideas as one of our Pearistas, See Vanessa Craft, throws her friend a surprise breakfast birthday! 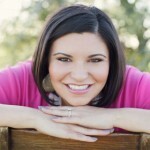 I recently hosted a surprise birthday party, rainbow style, for my dear friend Nicole of Petal Wishes. There are those people in the world that are just so giving and happily (and tirelessly) do so much for everyone else, without looking for any sort of payback or recognition. They are the people you can count on for just about anything and they usually offer before you even have to ask. Nicole is definitely one of those rare friends and I’m so grateful to have her in my life and my family’s life. Nicole, like me, loves a good party (check out the cowgirl party she planned) and I thought a surprise party would be the perfect opportunity to show her how appreciated she is by all of her friends. I think it worked because she was teary eyed the entire time, causing this hormonal pregnant lady to be teary eyed the entire time as well! The entire party was inspired by Pear Tree Greeting’s Color Stream Retro Party Invitations. How adorable are these modern invitations?! They’d work for just about any type of party – birthday party, baby shower, bbq, etc. I love how easy it is to modify colors and wording on the Pear Tree Greetings site to create the perfect invite! I took the rainbow theme of the invitation and ran with it. 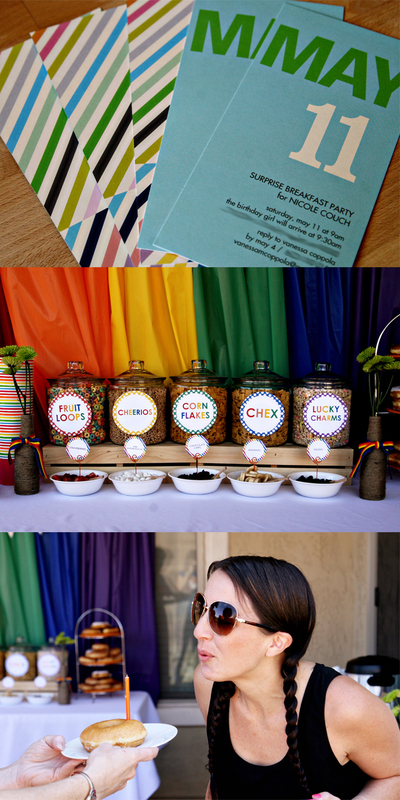 Lauren Haddox Design created the rest of the rainbow party printables used throughout the party (isn’t she amazing?!). I had guests arrive 30 minutes early and gave Nicole’s hubby the task of keeping her at home until she was scheduled to arrive. Not an easy task when the birthday girl was texting me that morning asking me if I needed her to arrive early to help set up for what I told her was a party for my blog. She was slightly early, despite her hubby’s efforts to delay her, but it all worked out and we pulled off the surprise. Guests enjoyed breakfast foods, a cereal bar and were entertained by a photo booth. The littlest guests colored rainbow coloring pages and played with bubbles at this outdoor party. The main centerpiece of this morning party was the cereal bar. I filled big glass containers with everyone’s favorite cereals, including Lucky Charms and Fruit Loops to match the rainbow theme. I included strawberry, mini marshmallow, chocolate chip, banana, and raisin mix ins for guests to add to their cereal. Shamrock Farms so kindly sent their on-the-go mmmmilk jugs for guests to enjoy. I also used Shamrock Farms milk for the little donut shooters I passed around the party, which were a huge hit! Who can say no to cute little donuts and milk in shot glasses?! We also had full sized donuts, fruit, mini chocolate chip muffins, a coffee station and OJ on the menu. This was probably the easiest party to plan decor around because colorful supplies are so easily to find at the moment, especially if you stick to the “ROY G. BIV” (red, orange, yellow, green, blue, indigo, violet) color scheme. I made my own party backdrop out of plastic tablecloths that I found at the Dollar Store. Cost effective and only requires a little bit of time and effort (tutorial coming soon). For table centerpieces, I painted the inside of mason jars using rainbow acrylic paints and stuck faux rainbow flowers inside. I hand stamped wooden spoons with the word “Celebrate!” and they were a perfect match for the colorful tub bowls used for the cereal. I glued rainbow pom poms to the tops of wooden sticks to use as coffee stirs and adorned striped paper straws with printable flags from Lauren Haddox Design. Finish reading about the rainbow breakfast party at SeeVanessaCraft.com! I’m Vanessa and it’s my mission in life to spread my love of hot glue guns and glitter to others. I suffer from craft ADHD, regularly working on at least 10 projects at the same time. I have a small (some may say unhealthy) obsession with the color mustard. Read and follow her blog SeeVanessaCraft.com.